Various biochemical processes responsible for the metabolic formation, breakdown, and interconversion of carbohydrates in living organisms. Carbohydrates are central to many essential metabolic pathways. Plants synthesize carbohydrates from carbon dioxide and water through photosynthesis, allowing them to store energy absorbed from sunlight internally. When animals and fungi consume plants, they use cellular respiration to break down these stored carbohydrates to make energy available to cells. Both animals and plants temporarily store the released energy in the form of high energy molecules, such as ATP, for use in various cellular processes. Although humans consume a variety of carbohydrates, digestion breaks down complex carbohydrates into a few simple monomers (monosaccharides) for metabolism: glucose, fructose, and galactose. Glucose constitutes about 80% of the products, and is the primary structure that is distributed to cells in the tissues, where it is broken down or stored as glycogen. In aerobic respiration, the main form of cellular respiration used by humans, glucose and oxygen are metabolized to release energy, with carbon dioxide and water as byproducts. Most of the fructose and galactose travel to the liver, where they can be converted to glucose. Some simple carbohydrates have their own enzymatic oxidation pathways, as do only a few of the more complex carbohydrates. The disaccharide lactose, for instance, requires the enzyme lactase to be broken into its monosaccharide components, glucose and galactose. Overview of connections between metabolic processes. Glycolysis consists of ten steps, split into two phases. During the first phase, it requires the breakdown of two ATP molecules. During the second phase, chemical energy from the intermediates is transferred into ATP and NADH. The breakdown of one molecule of glucose results in two molecules of pyruvate, which can be further oxidized to access more energy in later processes. Gluconeogenesis is the reverse process of glycolysis. It involves the conversion of non-carbohydrate molecules into glucose. The non-carbohydrate molecules that are converted in this pathway include pyruvate, lactate, glycerol, alanine, and glutamine. This process occurs when there are lowered amounts of glucose. The production of glucose by this pathway is important to tissues that cannot use any other fuels, such as the brain. The liver is the primary location of gluconeogenesis, but some also occurs in the kidney. This pathway is regulated by multiple different molecules. Glucagon, adrenocorticotropic hormone, and ATP encourage gluconeogenesis. Gluconeogenesis is inhibited by AMP, ADP, and insulin. Glycogenolysis refers to the breakdown of glycogen. In the liver, muscles, and the kidney, this process occurs to provide glucose when necessary. A single glucose molecule is cleaved from a branch of glycogen, and is transformed into glucose-1-phosphate during this process. This molecule can then be converted to glucose-6-phosphate, an intermediate in the glycolysis pathway. Glucose-6-phosphate can then progress through glycolysis. Glycolysis only requires the input of one molecule of ATP when the glucose originates in glycogen. Alternatively, glucose-6-phosphate can be converted back into glucose in the liver and the kidneys, allowing it to raise blood glucose levels if necessary. Glucagon in the liver stimulates glycogenolysis when the blood glucose is lowered, known as hypoglycemia. The glycogen in the liver can function as a backup source of glucose between meals. Adrenaline stimulates the breakdown of glycogen in the skeletal muscle during exercise. In the muscles, glycogen ensures a rapidly accessible energy source for movement. Glycogenesis refers to the process of synthesizing glycogen. In humans, excess glucose is converted to glycogen via this process. Glycogen is a highly branched structure, consisting of glucose, in the form of glucose-6-phosphate, linked together. The branching of glycogen increases its solubility, and allows for a higher number of glucose molecules to be accessible for breakdown. Glycogenesis occurs primarily in the liver, skeletal muscles, and kidney. The pentose phosphate pathway is an alternative method of oxidizing glucose. It occurs in the liver, adipose tissue, adrenal cortex, testis, milk glands, phagocyte cells, and red blood cells. It produces products that are used in other cell processes, while reducing NADP to NADPH. This pathway is regulated through changes in the activity of glucose-6-phosphate dehydrogenase. 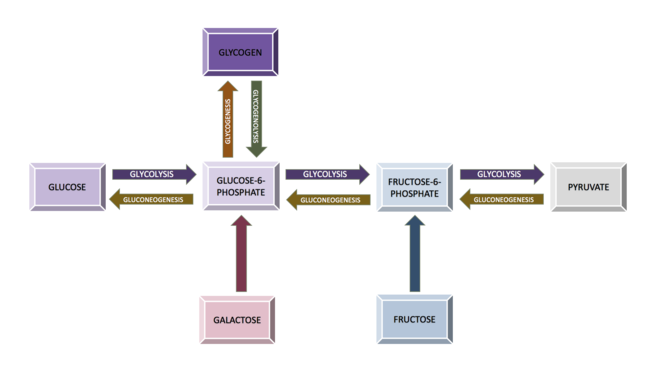 Fructose must undergo certain extra steps in order to enter the glycolysis pathway. Enzymes located in certain tissues can add a phosphate group to fructose. This phosphorylation creates fructose-6-phosphate, an intermediate in the glycolysis pathway that can be broken down directly in those tissues. This pathway occurs in the muscles, adipose tissue, and kidney. In the liver, enzymes produce fructose-1-phosphate, which enters the glycolysis pathway and is later cleaved into glyceraldehyde and dihydroxyacetone phosphate. Lactose, or milk sugar, consists of one molecule of glucose and one molecule of galactose. After separation from glucose, galactose travels to the liver for conversion to glucose. Galactokinase uses one molecule of ATP to phosphorylate galactose. The phosphorylated galactose is then converted to glucose-1-phosphate, and then eventually glucose-6-phosphate, which can be broken down in glycolysis. Many steps of carbohydrate metabolism allow the cells to access energy, and store it more transiently in ATP. The cofactors NAD+ and FAD are sometimes reduced during this process to form NADH and FADH2, which drive the creation of ATP in other processes. A molecule of NADH can produce 1.5–2.5 molecules of ATP, whereas a molecule of FADH2 will yield 1.5 molecules of ATP. Typically, the complete breakdown of one molecule of glucose via aerobic respiration (i.e. involving both glycolysis and the Citric Acid Cycle) is usually about 30–32 molecules of ATP. Oxidation of one gram of carbohydrate yields approximately 4 kcal of energy. Glucoregulation is the maintenance of steady levels of glucose in the body. Hormones released from the pancreas regulate the overall metabolism of glucose. Insulin and glucagon are the primary hormones involved in maintaining a steady level of glucose in the blood, and the release of each is controlled by the amount of nutrients currently available. The amount of insulin released in the blood and sensitivity of the cells to the insulin both determine the amount of glucose that cells break down. Increased levels of glucagon activates the enzymes that catalyze glycogenolysis, and inhibits the enzymes that catalyze glycogenesis. Conversely, glycogenesis is enhanced and glycogenolysis inhibited when there are high levels of insulin in the blood. The level of circulatory glucose (known informally as "blood sugar") is the most important factor determining the amount of glucagon or insulin produced. The release of glucagon is precipitated by low levels of blood glucose, whereas high levels of blood glucose stimulates cells to produce insulin. Because the level of circulatory glucose is largely determined by the intake of dietary carbohydrates, diet controls major aspects of metabolism via insulin. In humans, insulin is made by beta cells in the pancreas, fat is stored in adipose tissue cells, and glycogen is both stored and released as needed by liver cells. Regardless of insulin levels, no glucose is released to the blood from internal glycogen stores from muscle cells. Carbohydrates are typically stored as long polymers of glucose molecules with glycosidic bonds for structural support (e.g. chitin, cellulose) or for energy storage (e.g. glycogen, starch). However, the strong affinity of most carbohydrates for water makes storage of large quantities of carbohydrates inefficient due to the large molecular weight of the solvated water-carbohydrate complex. In most organisms, excess carbohydrates are regularly catabolised to form acetyl-CoA, which is a feed stock for the fatty acid synthesis pathway; fatty acids, triglycerides, and other lipids are commonly used for long-term energy storage. The hydrophobic character of lipids makes them a much more compact form of energy storage than hydrophilic carbohydrates. However, animals, including humans, lack the necessary enzymatic machinery and so do not synthesize glucose from lipids (with a few exceptions, e.g. glycerol). In some animals (such as termites) and some microorganisms (such as protists and bacteria), cellulose can be disassembled during digestion and absorbed as glucose. ^ a b c d e f g h i j Maughan, Ron (2009). "Carbohydrate metabolism". Surgery (Oxford). 27 (1): 6–10. doi:10.1016/j.mpsur.2008.12.002. ^ a b c d e f g h i j k l m n o p q r s t 1942-, Nelson, David L. (David Lee) (2013). Lehninger principles of biochemistry. Cox, Michael M.,, Lehninger, Albert L. (6th ed.). New York: W.H. Freeman and Company. ISBN 978-1429234146. OCLC 824794893. ^ a b c Sanders, L.M. (2016). "Carbohydrate: Digestion, Absorption and Metabolism". Encyclopedia of Food and Health. pp. 643–50. doi:10.1016/b978-0-12-384947-2.00114-8. ISBN 9780123849533. ^ a b c d Hall, John E. (2015). Guyton and Hall Textbook of Medical Physiology E-Book (13 ed.). Elsevier Health Sciences. ISBN 978-0323389303. ^ Hansen, R. Gaurth; Gitzelmann, Richard (1975-06-01). Physiological Effects of Food Carbohydrates. ACS Symposium Series. 15. American Chemical Society. pp. 100–22. doi:10.1021/bk-1975-0015.ch006. ISBN 978-0841202467. ^ a b c d e f g h i j k l m n o p q r s t u Dashty, Monireh (2013). "A quick look at biochemistry: Carbohydrate metabolism". Clinical Biochemistry. 46 (15): 1339–52. doi:10.1016/j.clinbiochem.2013.04.027. PMID 23680095. ^ a b Ramos-Martinez, Juan Ignacio (2017-01-15). "The regulation of the pentose phosphate pathway: Remember Krebs". Archives of Biochemistry and Biophysics. 614: 50–52. doi:10.1016/j.abb.2016.12.012. ISSN 0003-9861. PMID 28041936. ^ a b c d Ahern, Kevin; Rajagopal, Indira; Tan, Taralyn (2017). Biochemistry Free for All. Oregon State University. ^ a b Lebovitz, Harold E. (2016). "Hyperglycemia Secondary to Nondiabetic Conditions and Therapies". Endocrinology: Adult and Pediatric. pp. 737–51. doi:10.1016/b978-0-323-18907-1.00042-1. ISBN 9780323189071. ^ Brockman, R P (March 1978). "Roles of glucagon and insulin in the regulation of metabolism in ruminants. A review". The Canadian Veterinary Journal. 19 (3): 55–62. ISSN 0008-5286. PMC 1789349. PMID 647618. ^ Watanabe, Hirofumi; Hiroaki Noda; Gaku Tokuda; Nathan Lo (23 July 1998). "A cellulase gene of termite origin". Nature. 394 (6691): 330–31. doi:10.1038/28527. PMID 9690469. ^ Coleman, Geoffrey (8 February 1978). "The Metabolism of Cellulose, Glucose, and Starch by the Rumen Ciliate Protozoon Eudiplodinium Magii". Journal of General Microbiology. 107 (2): 359–66. doi:10.1099/00221287-107-2-359.